The HDJ-X7 shows why Pioneer has such strong heritage in the DJ headphones category, with durability and loudness its key strengths. There's diametric opposition in the DJ world: you're either behind Sennheiser, with its HD25 on-ears; or you're on team Pioneer, with its over-ear HDJ-X line. Which adorns your ears - or perhaps, more accurately for most, ear singular - most likely depends on what you're used to using, or which has proven its longevity and durability over years of use. After all, these aren't exactly listening headphones, they're tools of the trade. The latest mid-level DJ headphone in Pioneer's range, the HDJ-X7, is here to try and be your new booth buddy, promising better and cleaner monitoring at high volumes than its predecessor. Does it succeed? What you make of the HDJ-X7's comfort will depend on what you're used to wearing. Many DJs opt for these cans (well, usually the X10, the grade above, which offers certified sweat-resistance) and are therefore used to the way one earcup can flip back on itself, up and out of the way, maintaining a solid one-ear connection, which is handy why cueing up tracks while listening to the booth monitor. We find this design perplexing, though. It's just not comfortable having the backside of a piece of plastic stuck into one side of your head, nor has it ever been. But, as we said up top, it's down to what you're used to; knowing exactly how headphones are going to sit and can be adjusted is crucial. Pioneer already has its foot not just through the door, but fully on the other side of it - so to change this staple, familiar design would simply irk too many dedicated users. There'd be outcry. What you're really buying the HDJ-X7 for is durability. The metal frame - which is barely visible, the product looks rather plasticky overall - is super strong. Twist it, drop it, chuck it in a bag, do whatever. These cans are US Military Grade tested, so they're not going to fall apart after no time at all. And having been through a trio of Sennheiser HD25s over the years, we can tell you that's one of the areas and reasons people opt for the Pioneer. Worn like "normal" headphones, the HDJ-X7's padded earcups and headband are comfortable for periods of time, but do pinch a little. That can't be seen as a complaint though: you don't want DJ headphones to move anywhere, go flying off your head-nodding bonce and into the turntables or your vodka and soda. Oh no, the X7 will remain in place, rigidly, without quite feeling like your head's in an actual vice. Included in the box is a carry pouch - it's lightweight and simple, kind of paltry to our hard-case expectations - alongside two cables and a 3.5mm-to-1/4in screw-on adapter. The cables twist-lock into the left earcup's base, ensuring a solid connection that, if you're not used to it, will probably see you yank the mixer off the desk at a house party (unless you opt for the 3m coil cable, perhaps). Shame there aren't ports in both left and right earcups for you to choose which side of your hearing you want to damage the most. All in all, the Pioneer HDJ-X7 design is exactly as expected. It's what long-standing users have come to expect: solid built that'll last for years, a cable that isn't going to go snapping off (unlike the Sennheiser's equivalent), and usability that has an affinity with generations of DJs. Here's where the X7 differs the most compared to its predecessor: the 50mm drivers have been newly developed to provide, according to Sennhesier, "clean monitoring, even at high volumes." Which makes perfectly good sense: you want to play things loud, real loud. 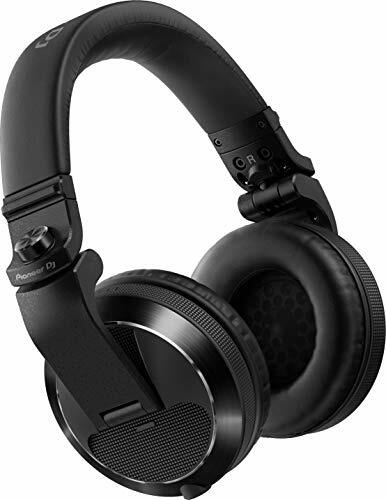 We could get bogged down in the technicalities of the sound quality, but as we say these aren't listening headphones, per se, they're DJ headphones to help make your job easier and more enjoyable. For that to happen the X7 needs to isolate sound, deliver ample bass and treble at sizeable volumes to easily pick out what you need to hear when in a loud environment. By and large, the X7 does its job. But we don't think it does it as well as the Sennhesier HD25. The X7's sound isolation isn't nearly as good at quashing the outside world, therefore you're likely going to need them at a higher volume. Sure, they deliver that volume without any qualms and will certainly tick the "ear destruction" box if you're not careful (which, again, isn't a complaint: DJs want this ultra-volume at their fingertips), but at least it's easy to wear erplugs underneath as there's no pressure from the over-eat design (which some on-ear designs present, which can cause a "muting" sensation with some 'plugs). We have spent some time listening to tracks casually at home, both earcups adorning ears, and can confirm the X7 delivers great vocal separation, fizzing high-end, and just enough low-end to discern kick drums, bass patterns and the like. We had anticipated greater bass definition, in truth, again as the Sennhesier HD25's direct-to-ear delivery is better for both casual listening and, in our opinion, picking out defined sections within tracks for cueing and beat-matching (if the kids even do that any more these days). That the HDJ-X7 can deliver from 5Hz to 30kHz is overkill, for sure. Producers filter sub-20Hz if they have any sense to keep tracks clean in the sub-bass section anyway, while no techno hi-hats are going to be gunning at 30kHz, as that's outside of human hearing spectrum anyway. Nonetheless, these cans have the meat where it matters: there's enough snap, crackle and pop to define and ensure you'll catch those important sounds when cueing up a mix. The Pioneer HDJ-X7 shows why the brand has such strong heritage in the DJ headphones category, with durability and loudness as its two key strengths. We still don't think comfort is on par with the Sennhesier HD25, however, but Pioneer has the upper hand when it comes to product life-span, based on our previous experience. If you want headphones that are versatile as both a daily listening and working DJ headphones then we'd plump for the Sennhesier and save a few extra quid in the process. If you're after dedicated DJ headphones as a tool of the trade then, arguably, Pioneer has the upper hand.